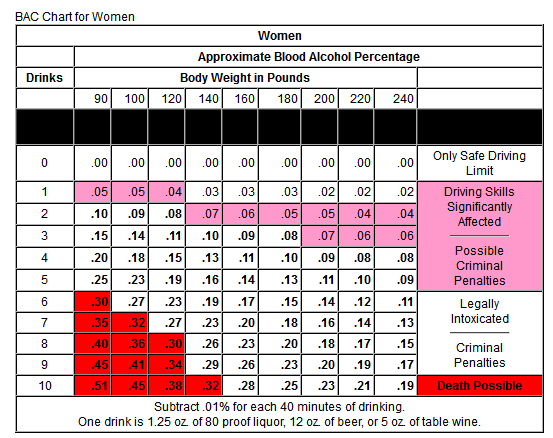 Back in 2011, I wrote a blog post that goes into the details on how the Blood Alcohol Content (BAC) versus drinks/time/gender are computed (Figure 1). These charts tell people how much they can drink and still stay under the BAC limits for driving under the influence. These charts are for a typical drinker and the actual BAC value will vary by person. Your BAC level will remain within safe limits if you consume only one standard drink per hour. Assume the person takes a drink at the top to the hour (1:00, 2:00, 3:00, etc). Compute the BAC one hour after consumption. Draw charts to illustrate how the drinker's BAC varies with time. Megan's model show that a 150 lb male following the rule of thumb eventually will exceed the legal limit. Since I use this blog as a repository for my Excel work, I have made an Excel version of Megan's work that you can access here. From my standpoint, no one should ever drive after drinking. However, this was an excellent use of spreadsheet to model a common rule-of-thumb. This entry was posted in General Mathematics, Health. Bookmark the permalink. Your title is a bit misleading - perhaps "One Drink Per Hour Can Get You Drunk"
Thanks Megan. I will correct.